The Portola boys’ baseball team has been doing what they can to get on the field during the extended rainy season we have been experiencing in Plumas County. They started at the Maxwell High School Tournament on March 15 playing Modoc, Fall River and Maxwell. They lost the first two games, Modoc 11-0 and Fall River 16-1, but tied with Maxwell 4-4. Against Fall River, the Tiger run was scored by junior Cody Callahan, with an RBI from senior Hunter Cabral. Callahan was feeling his oats and successfully stole a base from the Bulldog pitcher who wickedly struck out eight Tiger batters. Pitching for the Tigers was handled by senior Chandler Ross who struck out one Bulldog in four innings. Callahan provided relief pitching. Junior Drew Helbig served as catcher for the entire game. 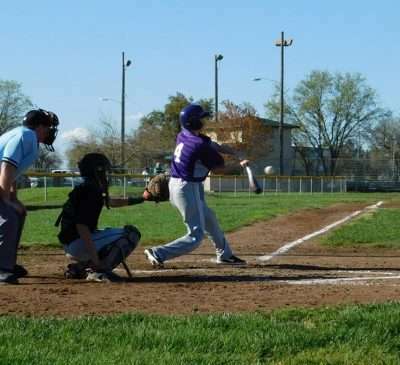 The Tigers took on the Maxwell Panthers in game three of the series March 30. PHS baseball did not fold when the Panthers came out with four runs in the first inning to the Tigers’ single mark on the scoreboard. PHS held the Bulldogs for the balance of the game. The Tigers were able to score a run in the fourth inning and two in the fifth, but were unable to add one more for the win. Runs were scored by juniors Justin Wicks, Hunter Cabral, sophomore James Sampson and senior Kyle Goodman. RBIs were hit by Callahan, sophomore Jaden Bok and Chandler Ross. Callahan hit a double. Helbig was the catcher for the game with Bok and junior Irving Juarez pitching. In six innings, Juarez was able to strike out five of 25 batters faced. Next, the Portola Tigers traveled to Nevada to win in a battle facing the HUG Hawks by a victorious score of 15-1. Boy did the Tigers enjoy that! Single runs were scored by Jaden Bok and freshman Lucas Helbig. A pair of runs each were scored by Callahan, Wicks, sophomore Zack Mulhall, Chandler Ross and Hunter Cabral. Three runs came from Drew Helbig! Wicks hit a triple, but the rest of the runs came one base at a time. Bases were stolen by freshman Michael Stewart, Drew Helbig and James Sampson. Callahan managed to steal two. Zack Mulhall served as catcher for the whole game for pitchers Chandler Ross and Hunter Cabral. Ross struck out six batters of 12 faced in three innings and Cabral struck out three batters in two innings with six batters faced. March 29 the Tigers traveled down the hill to a warm field at Biggs High School. “We lost 12-0, but enjoyed the sunshine,” said parent and photographer Kim Wilmer. 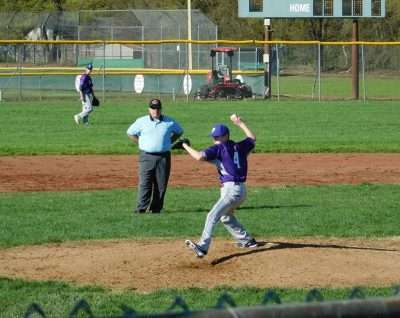 The tough Wolverines pitcher was sophomore Gregg Slusser who struck out nine Tigers of the 19 he faced in five innings. The next day, March 30, the Tigers played a doubleheader with the Mercy Warriors with two completely different outcomes. In the first game, the Tigers were neck and neck with the Warriors, losing in a squeaky close 15-14. PHS came out strong with three runs the first inning, two the second and another run in the third inning while holding the Warriors to a big fat zero. In the fourth inning, both teams scored four runs each. In the fifth inning, the Tigers scored two runs and Mercy scored three, making it 12-7 for Portola. At the bottom of the sixth the score was 13-10 and then came the seventh inning. The Warriors scored five big runs and held the Tigers to just one thus taking the victory for Mercy. Individual stats for PHS are not yet in. The second game with Mercy turned out entirely different. Neither team allowed the other to score for the first three innings in a standoff. The Mercy Warriors busted through in the fourth, fifth and sixth innings with 10 runs and that was that, 10-0 Mercy. 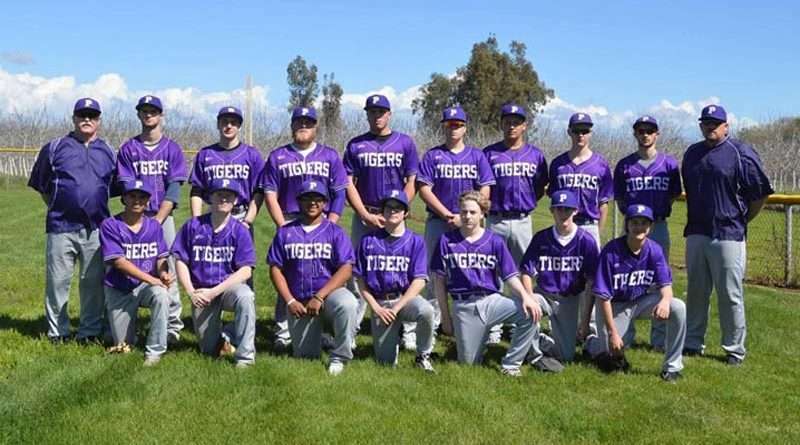 Coming up for the Tigers is a pair of games Monday, April 15, in Portola at 1 and 3 p.m. as the Tigers take on the Esparto Spartans. All things hang in the balance depending on rain and field conditions. It will be a slow-motion game if the boys have to don goulashes to play ball. Hopefully, the sun will be shining bright for a doubleheader with our neighbors in Loyalton on Thursday, April 18, as the Tigers host the Grizzlies at 2 and 4:30 p.m.
4/30 Fall River 4 p.m.